This sturdy, handmade folding rectangle plant stand is extremely easy to set up. The versatile stand can be used both indoors and outdoors to display your favorite potted plants. With a simple flip of your wrist this stand can be easily removed for storage or placement in another location. Weighing in at twenty pounds, this stand is sturdy enough to support heavy items; yet light enough to effortlessly move into new locations. The iron mesh shelves have been designed to provide a strong and secure surface for everyday use. The product has been powder coated for year round weather. 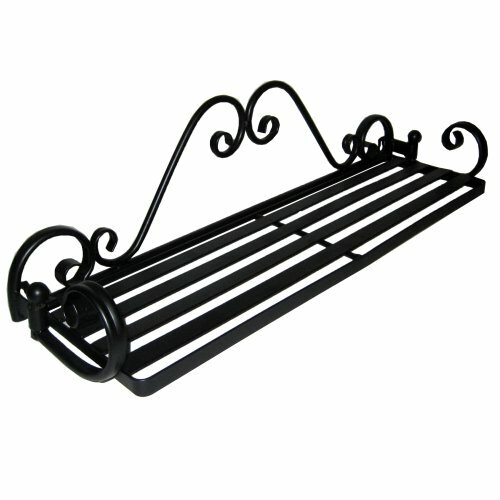 This is a product that has been handmade from recycled wrought iron. The dimensions of the rectangle plant stand when set up are 24-inch high by 24-inch wide by 28-inch deep. Each shelf is 9-inch deep. The dimensions of the rectangle plant stand when folded are 28-inch high by 27-inch wide by 4-inch deep. The three tier design translates to plenty of room for all your potted plants. The rectangle plant stand is currently available with a black finish. 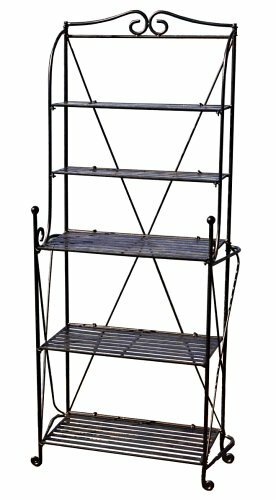 This versatile hand-made, wrought iron baker's rack is well suited for both indoor and outdoor use. The attractive powder-coated finish protects the rack from rusting when left outdoors and is weather resistant year round. Each sturdy shelf can hold all of your favorite indoor or outdoor items. 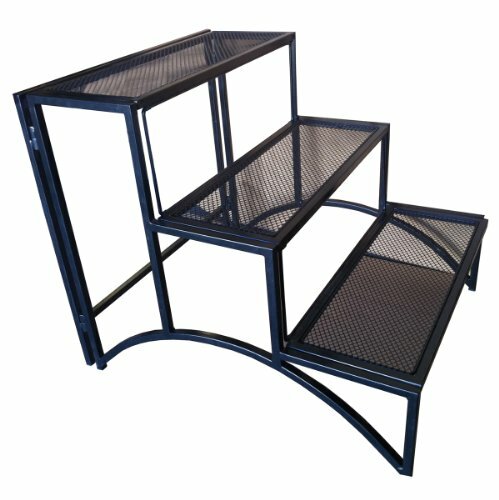 This rack was specifically designed to fall within the size limits of UPS transportation saving money on shipping costs. The dimensions of the top two shelves are 21 wide by 6 deep. The dimensions of the bottom three shelves are 21 wide by 11 deep. This sturdy, handmade folding plant stand is extremely easy to set up for in-season enjoyment. No tools are needed. 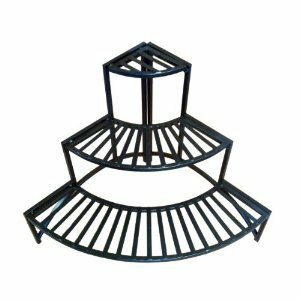 The plant stand is designed to support three garden pots that are 7-inch in diameter. The garden pots are not included. 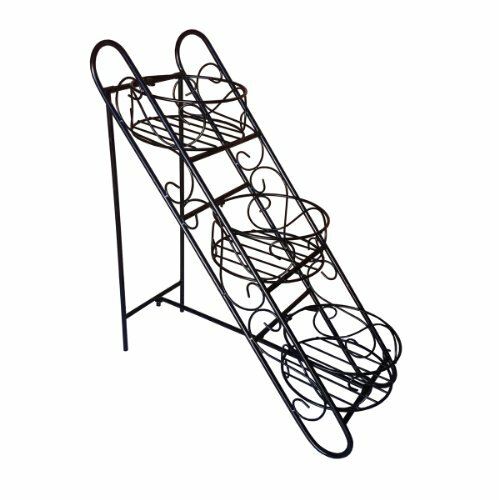 The plant stand is just as simple to fold down for space saving off-season storage. Weighing in at eight pounds, this plant stand is heavy enough to withstand high winds in inclement weather; yet light enough to effortlessly transport. The attractive powder-coated finish protects the iron frame providing year round weather resistance for use both indoors and outdoors. 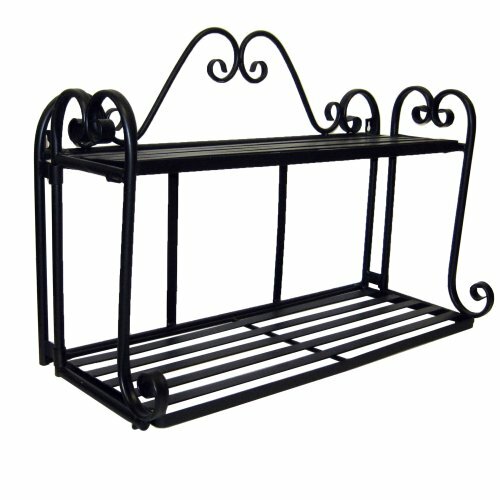 This is a product that has been handmade from recycled wrought iron. The dimensions of the plant stand when set up are: 22-inch high, 8-inch wide, and 18-inch deep. The three rings measure 7-inch each in diameter and 3-inch high. The dimensions of the product when folded are 28-inch high by 10-inch wide by 5-inch deep. This translates to plenty of room for other items in your storage space. 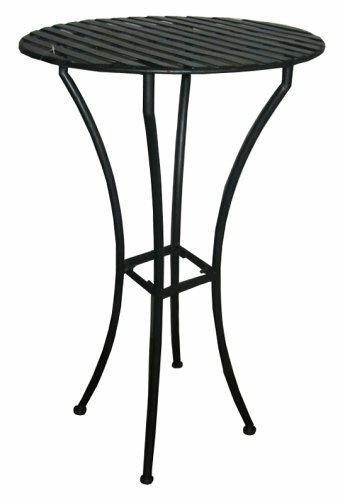 The plant stand is currently available with a black finish. 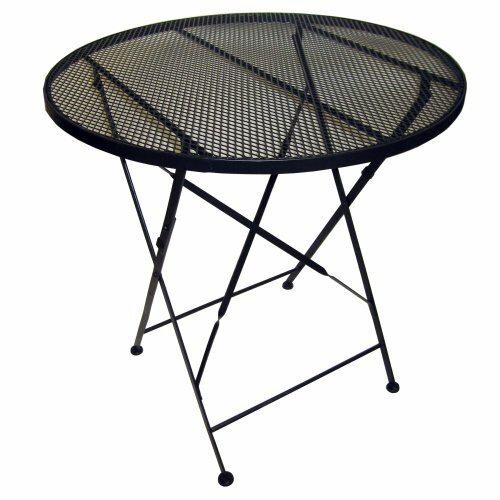 This sturdy, handmade wrought iron table folds flat for easy portability and space saving off-season storage. The attractive powder-coated, weather resistant finish protects the table from rusting when left outdoors. No garden, pool or patio setting is complete without the versatile Folding Bar Table. Enhances both small balconies and large patios/yards. The table is well suited for both suburban and urban appeal. This table was designed specifically to fall within the size limits of UPS transportation saving money on shipping costs. The Folding Bar Table is pictured here with our Folding Bar Stool. For the perfect set up, add a set of the bar stools to your table order! 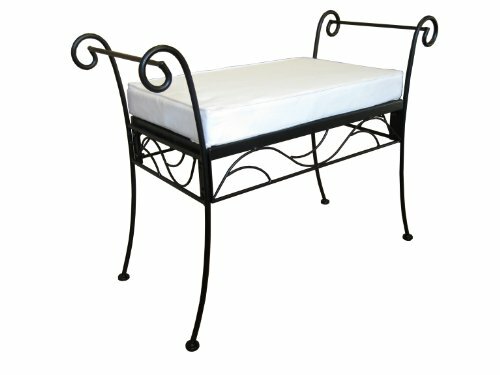 Looking for more Pangaea Folding Iron Garden similar ideas? Try to explore these searches: Lagoon Linen, Bedside Hospital, and Usa Embroidered Caps. Look at latest related video about Pangaea Folding Iron Garden. Shopwizion.com is the smartest way for online shopping: compare prices of leading online shops for best deals around the web. Don't miss TOP Pangaea Folding Iron Garden deals, updated daily.